She's vain, stubborn and prone to jealousy, but she's also magical, intensely loyal and oh so cute. 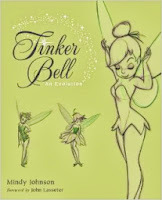 Outside of the Fab Five, Tinker Bell may be Disney's most beloved animated character. Animation historian Mindy Johnson's new book Tinker Bell: An Evolution traces Tink's history from her origins as a jingling beam of light in J.M. Barrie's original stage play Peter Pan to the lengthy and arduous trek that brought her to life at Disney. Mindy is my guest in The Mouse Castle Lounge as we discuss the popular pixie's many iterations over the years and the many artists and performers that contributed to her final look. How did Tink go from being a whimsical sprite named Tippytoe to become an iconic symbol of an entertainment empire with her own line of merchandise? Find out in today's edition of The Mouse Castle Lounge. Enjoy!